I discovered Mike Revell’s first book, Stonebird, when Quercus publishers sent it to me in addition to a prize I won. I was captivated from the first page – you can read the review here. Earlier this summer, Mike’s second book, Stormwalker was published. 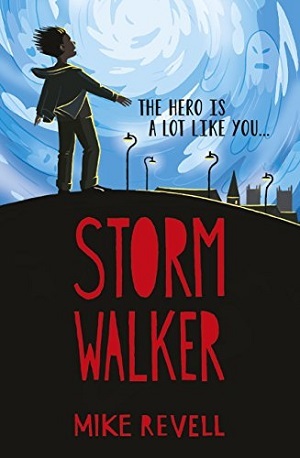 Stormwalker is the ultimate mash-up book for the age group – combining a contemporary story about Owen, a young boy both struggling to cope after the death of his mother and struggling to help his father, a writer, rediscover the joy of writing. This is meshed with an apocalyptic story set in a futuristic parallel universe in which a raging storm called the Darkness threatens to obliterate everything. The startling thing is that Owen is operating as a dual character featuring in both – with two different identities, one in each world, the latter world being the story his father is writing. Stormwalker is a fantastic read – paced beautifully, with incredible tension and yet a thread of fun simmering throughout. Like all the best apocalyptic movies – it has a running sense of impending doom that is lightened by an everyday boy’s approach to the danger. In fact Owen (Jack) is desperate to return to real life for a football game! Friendships are explored, and there is a fast and zippy dialogue…Mike knows exactly how to get into the head of an eleven year old boy. But he agreed to re-find his adult to answer some questions for me in association with YAShot. When did you start writing – and what was your journey to publication? I started writing when I was about 16, but I could never finish what I started because other ideas kept popping up. Ever since reading the third Harry Potter book a few years earlier, I knew that writing stories was something I had to do, so I kept at it, and eventually managed to finish a book. I sent it off to every agent I could think of, and it was rejected by all of them. I was expecting to get rejected, and every letter made me more determined to succeed, so I wrote another book and sent that out too. The first agent on my list both times was Gemma Cooper at The Bent Agency, and by some touch of magic she decided to sign me based on that second book. She remembered me from the first submission (note to aspiring authors: rejections aren’t all bad news!) and I think she quite liked that I had come up with two very different books. We sent this second book out, but it was rejected by every publisher. Somewhere along the way, I must have improved, though, because the third book I wrote was Stonebird, and that got picked up very quickly when we submitted it. The memory of what I was like as a kid. I was a very reluctant reader until I found Harry Potter as an 11 year old, and I have friends who never found their book and never started reading. I know what it’s like to hate reading, and what it’s like to love it, and that transformation is what drives every story I write: I hope to be able to give that feeling to other readers. Do you use a local library for research/writing? Yes indeed! Local libraries are always a starting point for me when I’m researching a book. The peace and quiet and rows of books provide a perfect oasis where whole worlds are waiting to be discovered. Sometimes I browse without any direction, just ambling along to see what I find, and this can often lead to some great nuggets I wouldn’t have come across otherwise. When doing the actual writing, I tend to stick to my writing room (in a cupboard under the stairs – ha!) or sometimes a cafe to change it up a little bit. Both your books feature sad family events – one in which the grandma is suffering from dementia and a child’s mother is failing to cope, and another in which the boy’s mother has died. Do you think it’s important in literature to portray children going through difficult times? That’s a good question. I don’t think it’s imperative to portray children going through difficult times in that sense. Of course, every story will have some innate difficulty, because a story without conflict isn’t really a story at all. But books have a special kind of magic in that they allow you to talk about things and think about things that are otherwise quite difficult subject matters to discuss – like dementia. I didn’t write about dementia expressly because it’s important to portray it in literature; it was just a personal story that I had to tell. 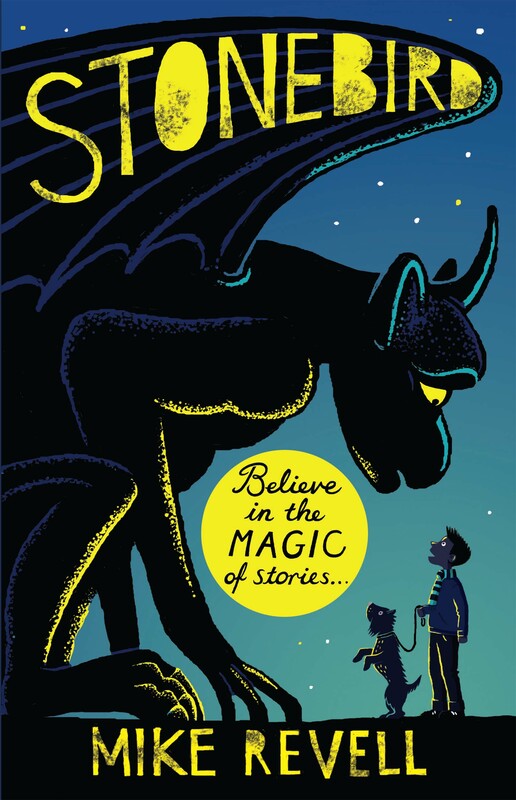 But if I can help children dealing with difficult times through my writing, then that’s something very special and unique to the magic of stories. Both of your children’s books so far weave real life with the fantastical (magical realism). Do you prefer books that have a balance of the two? In Stormwalker, there is a particular duality – one person with two different lives. Do you think people are like that in reality – the person we are, and then the person other people see? When I write, I think back to what I was like as a kid, because I figure that if I can write a story that the me-who-hated-books would like, then hopefully I’m doing okay. And back then, unless there was something fantastical about it, I wasn’t interested in the slightest. I think everything I write will always have some form of magic in it, however small. But it’s great fun playing around with that fantastical element, and balancing it with reality. I think both Stonebird and Stormwalker have been experimentations with that balancing act. And totally – especially in today’s social media world, there’s always going to be a bit of a duality reality! You’re something of an expert on American football. Would you consider writing a series of fiction titles based on the sport? Ooh, I do LOVE American football. It would be great to weave it into a story somehow, especially as the kids in schools over here always seem very interested in it, but I haven’t quite figured out how to do it yet. Which children’s book would you most like to have written? As for the children’s books I would most like to have written, I’ll have to say The Graveyard Book by Neil Gaiman, Rooftoppers by Katherine Rundell, and of course Harry Potter. You say you write for your 11 year old self. Despite being a reluctant reader as a child, was there any particular book or magazine that hooked you into reading? The earliest story I remember enjoying was The Hobbit, which my teacher read to me in Year Five. Incidentally, she was the same teacher who used the magic marble egg that I pilfered for Stonebird. But at this point, reading still felt too much like work to me. I enjoyed having stories read to me, but I never wanted to read myself. Harry Potter opened that door, then afterwards I was able to find other books, books like Skellig, which really helped to develop that fledgling love of reading. There’s something so purely beautiful about that book, it’s hard not to enjoy reading it. With thanks to Mike for answering all my questions without hesitation. You can purchase Stonebird here and Stormwalker here.